Longtime ​Alabama lawmaker, State Representative George Bandy Sr. died early Tuesday morning in a Macon, Ga., hospital, according to Alabama House spokesman Clay Redden. 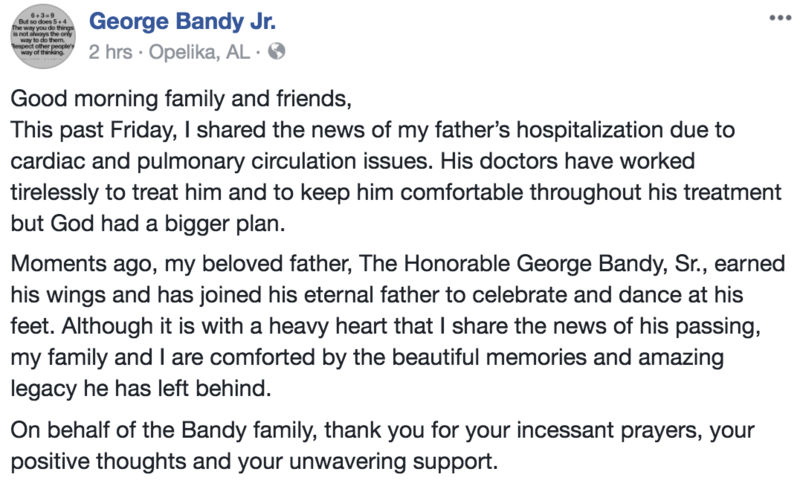 According to Bandy’s son, he passed away due to cardiac and pulmonary circulation issues, which he was hospitalized for last week. “I am saddened to hear of the death of state Representative George Bandy. Since his election in 1994, he has been a dedicated public servant to the people of Lee and Russell counties. My thoughts and prayers are with his family, friends and fellow legislators during this difficult time,” said Gov. Kay Ivey following his passing. Bandy served as the representative for House District 83 representing Lee and Russell counties. He represented the district for over 20 years. He was Chair of the Alabama House of Representative’s Lee County Legislation committee and served on the State Government and Transportation Utilities and Infrastructure committees. He was also Pastor of Saint James Missionary Baptist Church. 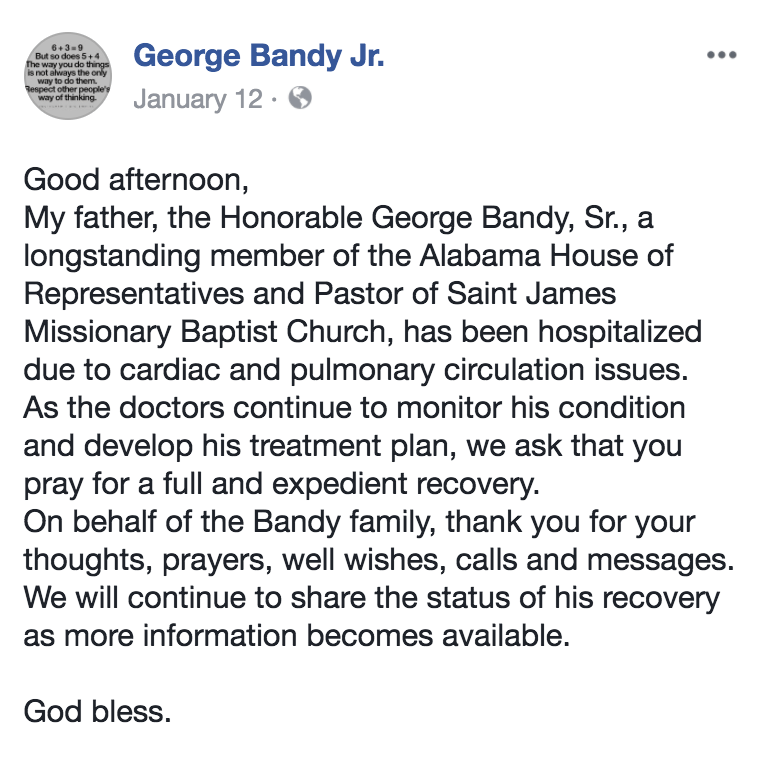 On Jan. 12, his son George Bandy Jr., posted on Facebook asking for prayers for his father as he had been hospitalized due to cardiac and pulmonary circulation issues. “He was a true fighter for his constituents and region especially focused on education and tax reform. He served diligently in the education system and continued his fight in the Alabama House to ensure his districts had the funding and resources to invest in education. He also introduced legislation on tax reform and worked to represent and support the lower income constituents of his district to ensure everyone he represented had equal representation,” Daniels said in a statement.